Explore Your Craft wasn’t just another beer tasting – it was a presentation of four different crafts that created an amazing sensory experience. Combining visual art, music, food, and beer, Explore Your Craft was a feast for the senses. 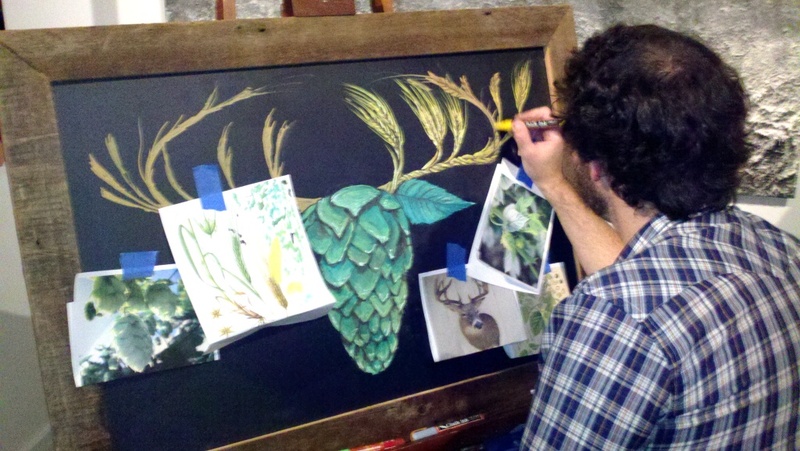 I attended the event, presented by Widmer Brothers Brewing and Draft Magazine, on Wednesday, October 3 at Long View Gallery in Washington, D.C.
We watched a chalk artist, Patrick Owens, draw a 12-point Buck as a hop cone and barley. Just take a moment to check out my picture below! And they invited the attendees to help create a special, one-of-a-kind work of art. A large stenciled canvas was tacked on the wall; paint and brushes were provided so that you could add your own artistic touch to the creation. Wish I had stayed until the very end of the event to see the beer-fueled final result! Justin Trawick’s self-described “Urban Folk Rock” provided a vibe of positive energy that enhanced the beer sampling experience. The food experience didn’t end there. Aaron Willis and the Whole Foods team filled a large table with a variety of artisan cheese, each labeled with a recommended beer pairing. I tried a few of the recommended beer-cheese combinations and they were amazing! OKTO Festival Ale (5.3%), I had a preview of this full-bodied and flavorful Fest when I brought home a 6-pack of bottles the weekend before Explore Your Craft. SxNW Dark Ale (9.3%), aka South by Northwest, this brew is made with chilies, chocolate, cinnamon, and toasted pecans. A multi-dimensional beer with traditional Southwest flavors. Marionberry Hibiscus Gose (5.5%), brewed with Oregon-grown marionberries and dried hibiscus flowers for a tart profile. Beautiful cranberry color. Pitch Black Ale (6.5%), Widmer’s take on a Cascadian Dark Ale, this is a smooth and roasty IPA. Old Embalmer Barleywine (10.2%), the 2012 version features Bravo hops for a perfect balance to the malty backbone. At 10+ ABV, this was the strongest brew of the night. Nelson Imperial IPA (8.6%), this deceptively strong Imperial IPA was my favorite beer of the night, especially when paired with blue cheese. Brewed with Nelson Sauvin hops from New Zealand. I just picked up a 4-pack of bottles from Magruder’s! Barrel Aged Brrrbon (9.5%), this smooth winter warmer aged in Kentucky Bourbon barrels had a nice Bourbon nose. Raspberry Russin Imperial Stout (9.3%), chocolate and roasty notes are complimented with subtle raspberry flavor. Falconer’s IPA (7.0%), a bright, light-on-the-tounge, easy drinking IPA that clocks in at a surprising 7% ABV. Drifter Pale Ale (5.7%), a citrusy and drinkable American Pale Ale. Milk Stout (7.0%), a silky, smooth, and sweet, but well-balanced Stout. Before this tasting, I had tried plenty of Widmer Brothers brew but I wasn’t aware of the range or creativity of this brewing company. 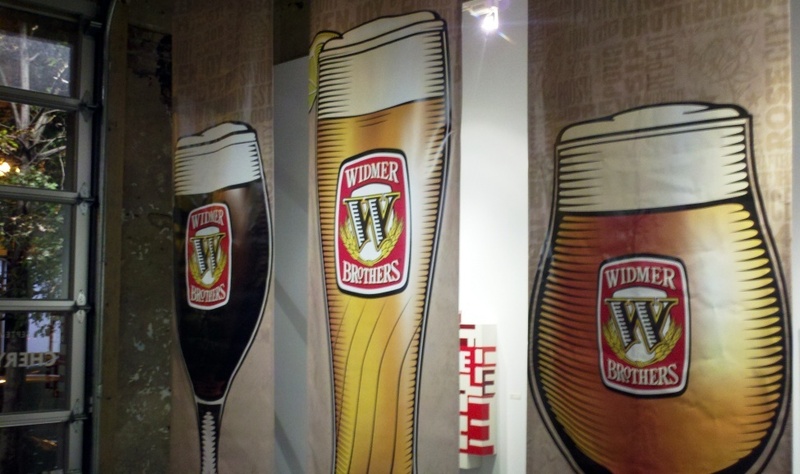 Explore Your Craft highlighted not just the great brews being produced by Widmer, but also the sophistication of the craft being experience.